The well of picture books possessing that alluring duality to entertain and inspire never seems to run dry. Here are a few new titles to keep you topped up. Phil Lesnie used pencil, watercolour and a tiny bit of gouache to decorate Cummings’ story of compassion and hope. According to his note, he also spilled his coffee on it twice and left it in. Despite his refreshing flippancy, both he and Cummings have created a picture book awash with extreme visual sincerity and narrative beauty. Their story follows the flight of a migrating sandpiper whose tug for home takes the reader through crumbled war-torn landscapes, over deep river valleys, through dark stormy nights, and across flood-ravaged plains and turbulent seas until finally coming to rest near Mia’s house. At various locations, a feather or two is lost, each causing a reaction between those who happen upon it, connecting us, the reader, with the inhabitants from lands far distant and their circumstances. The sandpiper is a curious yet brilliant choice for the allegorical conduit between that which is normal for some and catastrophic for others. 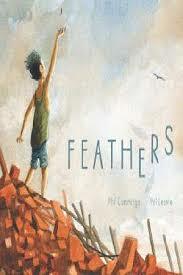 Feathers promotes themes of immigration, hope, tolerance, cultural awareness, compassion and humanity in a divinely beautiful way. Highly recommended for primary aged readers. 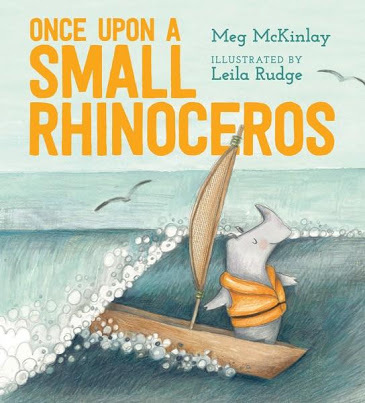 When a small rhino sets off across a the ocean waves in search of something more, he discovers a world of possibilities and wonders greater than he could have ever imagined and the satisfaction of eventually returning home. This is a comely tale of living your dreams to their fullest and ignoring those soothsayers who warn you otherwise. See Romi’s full review, here. 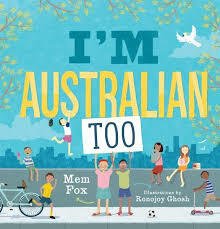 I’m Australian Too focuses on multiculturalism from within our own backyards or indeed, the backyards of a dozen or more typically Aussie kids with not so typically Aussie roots. Celebrating diversity in a way that pre-schoolers will relate to, Fox uses simple verse and a conversational tone to prompt readers to investigate their own cultural heritage and to not only celebrate it but embrace those with different family histories, as well. Each introduction ends on a bouncy high note suggesting that no matter where we originate from, no matter what the circumstance of our being Australian, we are all one and better for it. One of the most powerful and affecting picture book teams around, join forces again to present Sarah’s story of seemingly insurmountable odds. Sarah is unable to leave her home because of a slope. It blots out the sun and surrounds her house blocking every exit. Despite her best efforts, the slope will not budge, trapping Sarah, ‘all day long’. Until the slope doctor makes a suggestion and with the help of her friends, Sarah discovers a way to see past the slope and to conquer it. 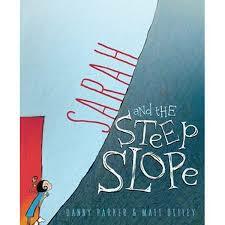 Sarah and the Steep Slope is a tremendous story of courage, friendship and emotional resilience. Occasionally we, including young children, all encounter slopes like Sarah’s that effectively prevent us from seeing what is beyond and inhibit us from venturing further than we need to. Parker’s narrative gives one hope and salvation from negative thoughts and actions by illustrating the formidable healing power of friendship. Ottley reinforces this notion of self-belief with utterly lovable, whimsy-filled illustrations that bathe each page with texture and meaning without imagery clutter. Another masterpiece and my new best favourite.